Small bathroom storage challenge Every design element in a small bathroom should have a purpose and be functional in some way or another to create a space-saving sanctuary. Small bathrooms may seem like a difficult design task to take on; however, these spaces may introduce a clever design challenge to add to your plate. Creating a functional and storage-friendly bathroom may be just what your home needs. This clever storage unit functions as a towel holder and shelf. This makes perfect use of that space above your towels that goes unused. If you want to DIY, simply install a shelf above your towel bar for a frugal small bathroom tip. This next small bathroom storage saving design uses the rod system to save space and add organization. These can be purchased in kits or you can DIY this great storage idea. Floating shelves are a great DIY project to help give you more space in any size bathroom. These shelves can virtually go anywhere, but most popularly are installed above the toilet or above the door. This towel holder and shelf system is a great idea when you have a large family and do not have the space for a million towel bars. If you hate this piece you can opt to just install these hooks anywhere you wish in your small bathroom. 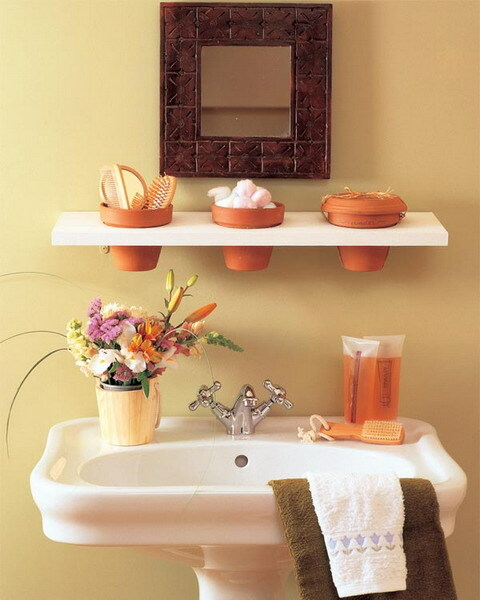 Plant your tooth brush and bathroom goods in these uber cute clay pots above your sink. If you aren't into the garden look for your bathroom you can also try wooden organizers.